***So often I hear of people who make wishes. And that’s all they do. They wish. They take their dreams, hopes, goals, and they toss them up in the air, hanging them on the star of their choice. Then they sit back and wait… wishing. I know this may sound jaded, but I think wishing on a star, and leaving it at that, is about as useful as tossing your shoes over an electric line. Yes, it’s kind of fun… but what’s the point? 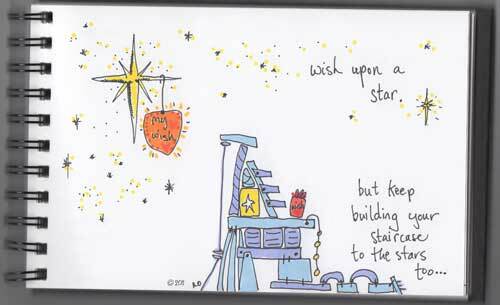 Why not build your own staircase to the stars (and your wishes)?!? Why not take the time to craft your own platform that allows you to climb up to the stars with your wish in hand. Wouldn’t that get you closer to making it happen?? So, my advice to myself is simple: wish on the stars (because it’s fun), but keep on doing the work that will get you there too. Have you made a wish lately? Did it come true? Did you have to work for it?? ***Hhhhmmmm…. what’s missing today??? Aah, yes, the picture! That’s right, you observant people – there is no picture today. My apologies for this; we should be back online come Monday. So what happened? Last night I began the process of scanning in the drawing for today and I LEARNED something about my scanner. It will not scan when it is out of ink. I cannot bypass this. I cannot shortcut around it. I have to refill the ink cartridge (this is not a useful feature at 10 pm). You see my scanner is also a printer and apparently it will not work if it has run out of ink. While that seems inconvenient and kind of poorly designed to me, I have LEARNED that there is nothing I can do about it, except replace the ink cartridge. Hence (to pull from yesterday’s advice), my planned post is the car and my printer is the bird. Oh well. So with that said let me just say again “Happy Friday and have a lovely weekend!” See you on Monday (with a picture). Some days you are the bird. Some days you are the car. ***Someone asked me recently if it’s always “sunshine and rainbows” in my world. My first response was shock (that someone out there thinks my world is that great), my second was pleasant surprise (that I’m putting up a pretty good front), and my third was reality. 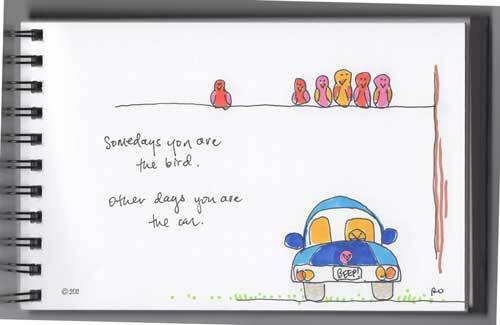 This is the reality: there are good days and bad days (the bird vs. the car). It’s all in how you frame it, what you learn from it, and how you move forward. There have been plenty of “car days” recently. The key is dusting myself off, cleaning up the mess, and figuring out what I learned. And sometimes, unfortunately, there is nothing to learn; it’s just a bad day and I got pooped on. So what? Move forward. ***I’m feeling a little seasonal right now. Embrace fall. Carve pumpkins. Next thing you know I’ll be telling myself to get a costume and go trick-or-treating! So this thought, about pumpkin carving, also came from a walk I took this week. I am so amazed by the creativity of people and what they can do with a simple pumpkin. I am also amazed by the variety of pumpkins that exist now. I’m pretty sure when I was kid pumpkins came in orange or orange or maybe orange. Then there were the small, medium, so-large-I-need-help-carrying-it sizes. And finally there were round, oblong and slightly misshapen. Not anymore! I’ve seen every shape (except square, but I’m sure someone somewhere is working on breeding a box-like pumpkin shape), so many different colors (it’s not just orange anymore! ), and the large size needs another term now, like gargantuan-monstrous-eating-the-front-porch. So in the spirit of all this crazy-pumpkin-carving-madness… I am hoping to pick one up this weekend, grab a knife, some newspapers, and go to town. 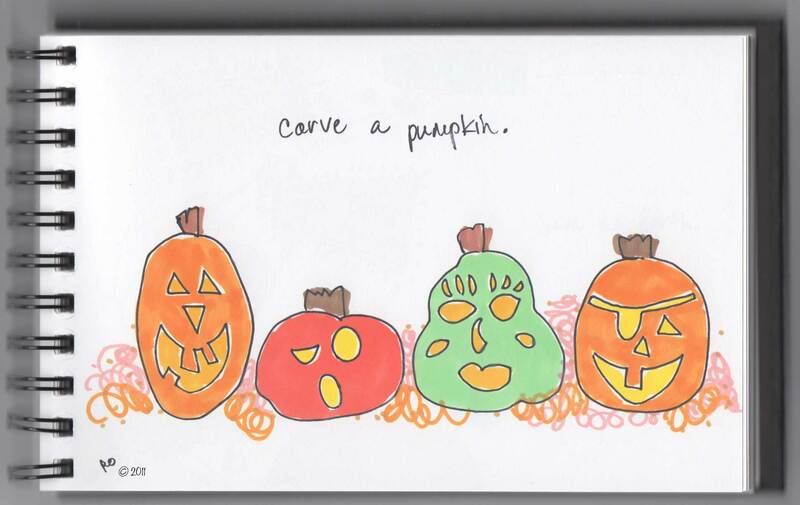 Have you carved a pumpkin this year? If so, what sort of design?? Would you be willing to share a picture with me?!?! P.S. I’m also hoping to save the pumpkin seeds a do a little roasting. Aaah, nostalgia. 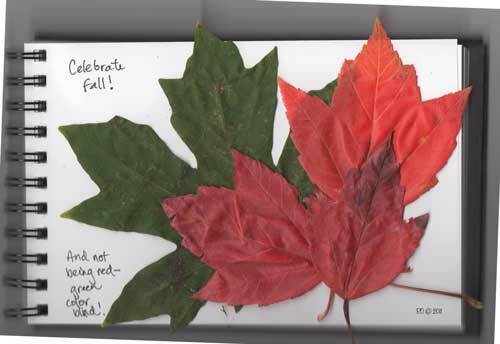 Celebrate Fall and not being red-green color blind! ***I went for a walk last night and I was repeatedly amazed by the colors exploding around me. At the end of my walk I picked up a few leaves that were scattered on the street and figured I would share them with you. There were deep vibrant greens, bright explosive reds, shocking fiery oranges, roast toasty yellows, and even a few rich regal purples thrown into the mix. Everywhere I turned there were amazing contrasts of color that stood out against one another. It reminded me of two kids fighting for attention. Needless to say I was thoroughly entertained by color throughout my meander round the neighborhood. I was also very grateful to not be red-green color blind right now. I would be missing half the fun of fall!! Do you enjoy the fall colors? Do you live somewhere that the leaves change color? Do you have a favorite color combination?? It’s the only planet with chocolate. ***So imagine you are out cruising the interspace highway in your shiny red rocket ship and you blow past Mercury when you see a satellite floating around with a sign that says “Only 57,000,000 miles to chocolate”. The sign is all-a-glow and flashing, just like those signs you see on the highway for burgers, girls, or Pea Soup Andersens. You keep on cruising and Venus flashes by you in the side window… only 26,000,000 miles now! Dark or milk or maybe white you start thinking… candy bar or truffle or hot chocolate? You start to work your way over to the exit lane, still cruising at a good speed. And somehow you end up stuck behind a cargo space ship that’s kicking up all sorts of space dust and debris on your shiny red rocket ship, and it’s going a good 10,000,000 miles an hour under the speed limit. Gggrrr. What’s a chocolate-loving-space-adventurer to do?? Well, of course you zip around on the left, unfortunately missing the exit for Earth in the process, and the last chance for chocolate anywhere in the galaxy. Next thing you know you’re at Mars and there’s a gaudy flashing sign that totally clashes with Mars’ red, and you have to go back 48,000,000 miles or find something else to snack on. Bummer. So the moral of the story is 3-fold: Save the Earth. Be patient (even if you’re stuck behind a truck). And eat chocolate. Addendum: I cannot take credit for the thought “Save the Earth. 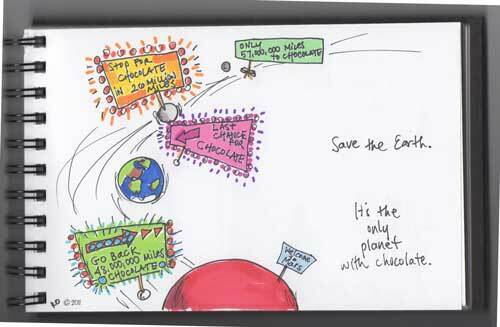 It’s the only planet with chocolate.” It was shared with me via email and I just felt inspired by it. If anyone knows the original author/authoress of this thought please let me know! Find fun in the weather. ***I recently moved from a sunny, temperate climate to a place where it rains… a LOT. Sometimes it depresses me that I have not seen blue sky or sunshine in over 48 hours. That is a long time compared to where I moved from. I am also acutely aware that this length of time, 48 hours, will seem excitingly short for breaks between sunshine by the time the winter is over. So what’s a newly transplanted sun-lover to do?? 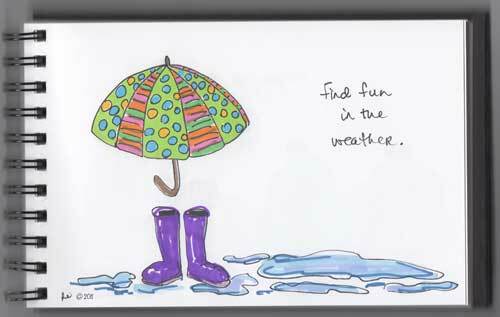 Find fun in the weather! I have decided that if it is going to rain for the next 8 months I might as well have fun rain boots, colorful or patterned umbrellas, and whatever other accoutrements make this FUN.